I’ve eaten most of a carton of this product in several sittings, but each time I just can’t get past the odd texture. If you’ve read my other ice cream reviews, you’ll know I am a big fan of creamy texture (heck, who isn’t?). Unfortunately, eating this ice cream right out of the freezer, or even 5-10 minute later, gives an unappetizing rough, icy texture. I even tried to break up the cream into tiny pieces with my spoon to facilitate the melting process, but that was only partially effective. After around ~20 minutes of waiting for it to melt, I finally got one spoonful of something I’d consider partially creamy. If this was my first taste of a coffee ice cream I might be OK with this, but I’ve had at least two others that are much, much tastier and creamier (Talenti’s Coffee Chocolate Chip and Three Sister’s Milk Coffee). 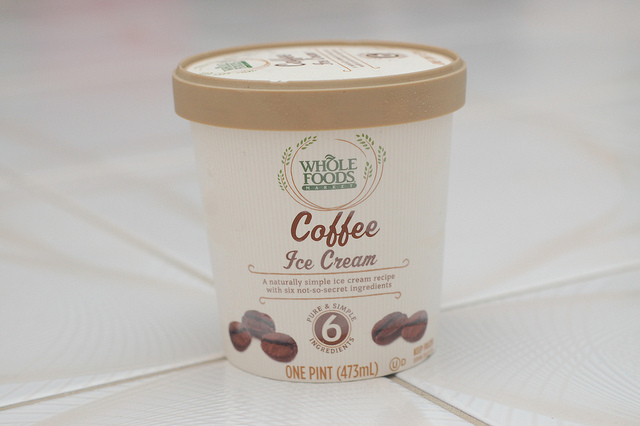 The taste itself in Whole Foods coffee ice cream is only so-so, with a strong element of coffee and milk, and a weak sweetness. I think the problems with texture, as well as taste, stem from not enough sugar being used. Though I appreciate the effort to try and reduce sugar for health reasons, this reminds me of some experimental batches of ice cream I’ve made in my time. This ice cream has only 180 calories in a single serving (1/2 cup, 90 grams). That’s near the low end of ice creams of this type. Sugars are only 13 grams. This is very low compared to Three Twins milk coffee, which has 17 grams. Its also lower than most other ice creams out there, by a large margin. With only six ingredients, and no artificial flavorings or colorings, it does get much more natural and simple than this. Two differences between the Three Twin’s product and this are the order of the coffee and egg yolks (they are reversed), and the lack of vanilla extract in Whole Food’s product.Full Ingredient List: Pasteurized milk, pasteurized cream, cane sugar, egg yolks, and carob bean gum. I got this for around $4.99 at Whole Foods Market. Any points this product gets for healthiness and natural ingredients are cancelled out by a completely non-creamy texture and mediocre taste. Like some of Three Sister’s other products (including this one that I reviewed), Multigrain Berry does a great job at preserving the taste of a classic cereal (Post Frosted Shredded Wheat). For those who haven’t had this before, each bite is a bundle of shredded wheat with a sweet frosting coating. The rough, chewy texture is quite enjoyable and gives your jaw a workout. The addition of fruit flavoring adds a nice taste which is not present in Post’s basic shredded wheat. Serving size is 1 cup (55 grams) and there is about seven per package. In one serving there is 190 calories (only 10 from fat), 6 grams of fiber, 5 of protein, and 11g of sugars. These stats are all pretty much the same as Post’s version, which is not much a surprise considering the near-identical flavor. However, as this product is marketed as the “healthier” version of that, I wish they had at least a little less sugar, or more fiber/protein. The ingredients are generally natural and safe, though its disappointing there is no real Blueberry or Pomengranate, rather some mysterious “natural flavor” to simulate their taste. I wish companies which claim to make healthy products would use fruit, not some substitute. The ingredients here win out over many competitor’s products, which use either artificial flavor, artificial color, or BHT as a preservative.Post’s Frosted Mini Wheats “with a touch a fruit in the middle” is one such product that uses all three. 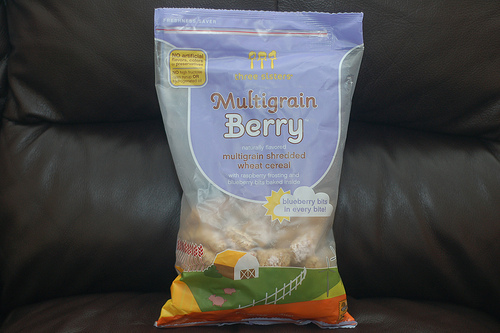 Multigrain Berry uses all fruit & vegetable extract/juice for coloring, and Vitamin E instead of BHT as a preservative. There is still some debate on whether BHT increases or decreases cancer risk, but my feeling is that Vitamin E is generally safer as a preservative. For those who don’t know what ‘Triticale” is, it’s a hybrid of wheat and rye which can give yield improvements and allow growing in different conditions. It also has more protein than wheat. 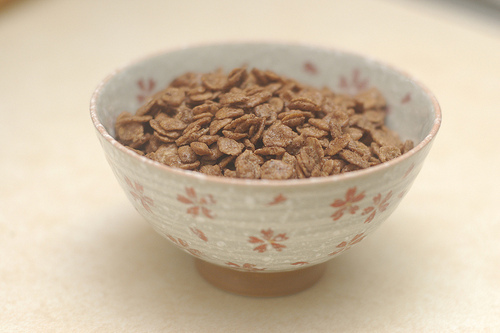 It is well established as a feed grain, but its use in cereal is relatively new. We got this for $3.99 for two at Whole Foods on a special promotion. Usually its $3.99 for one. 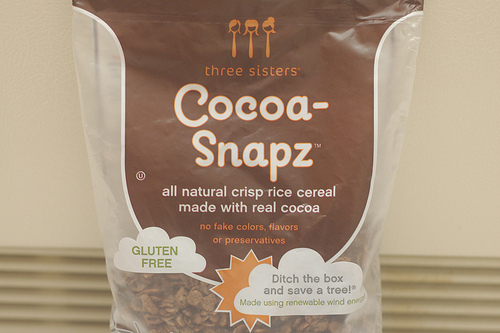 This cereal mostly lives up to its goal of making a healthier version of Frosted Mini Wheats. Fans of that type of cereal are highly recommended to try this. 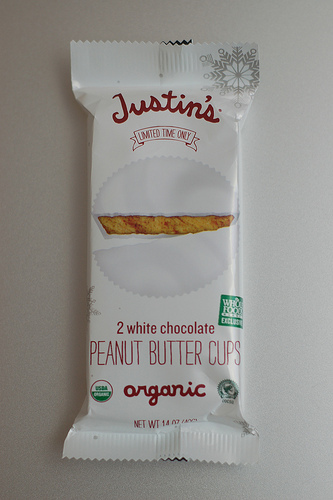 I’m a huge fan of Justin’s products because of their great taste and natural, simple ingredients. 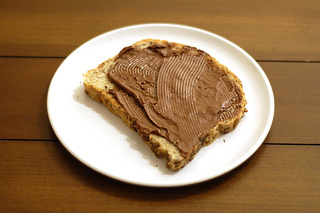 I reviewed their Chocolate Hazelnut spread and their Maple Almond Butter spread previously. These peanut butter cups consist of a white chocolate shell surrounding a peanut butter filling. Honestly, I usually prefer dark or semi-sweet chocolate to white, but the buttery flavor of white chocolate fits well with the earthy peanut butter taste. The peanut butter filling seems like the same mixture they sell as a separate product, with a smooth, rich flavor and no strange overtones. Justin’s also sells milk chocolate and dark chocolate versions of this product which are also quite tasty. What I really like about this set of products is that they are easy to eat on the go and make portion control easy. One serving is two cups (40 grams), and contains 180 calories, 17 grams of sugar, and 4 grams of protein. These cups pack a hefty sweetness in a small package, but after all they are considered a candy and meant to be eaten only a pack at a time. 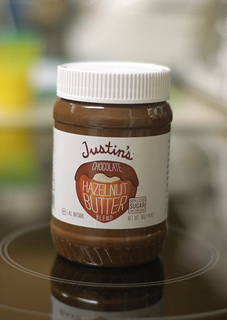 As with Justin’s other products, the ingredients are top class and are all organic, all natural, with no artifical/natural flavors or colorings of any sort. They are also fair-trade which means buying this product helps farmers in developing countries build sustainable businesses, another thing which should make you feel good about this product. Ingredients: Organic White Chocolate (Organic Sugar, Organic Cocoa Butter, Organic Whole Milk Powder, Organic Soy Lecithin, Organic Vanilla), Organic Peanuts, Organic Evaporated Cane Sugar, Organic Cocoa Butter, Organic Palm Fruit Oil, Organic Vanilla Flavor, Sea Salt. According to Justin’s web site, these are only available via Whole Foods Market for a limited time. I have only seen them in the stores very recently, so I guess they are intended for the holiday season, possibly for a “white christmas” concept. These sweet peanut butter cups are a great healthy snack with ingredients you don’t have to fret about. Be sure to try a pack or two before they stop production. In my high school days there was a time when I frequently ate ice cream sandwiches – vanilla ice cream held between two chocolate cookies. But it was just a passing craze for me, and many years have passed since I went on to other desserts. 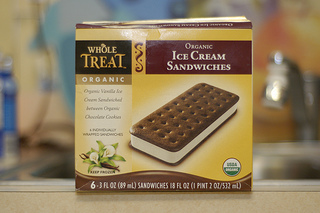 Recently I discovered Whole Foods made their own “healthy” version of the traditional ice cream sandwich, so I decided to try them out. By far the most noteworthy thing about this product is the texture, which is pretty rare as desserts go. Neither the ice cream nor the cookie, both very sweet, are exceptionally tasty on their own. And yet together they make a perfect match – the dark cookies with their tough, chewy texture contrast well against the soft, pure white ice cream. The latter is always the perfect consistency, even when pulled straight from the freezer, thanks to rich cream being used as the main ingredient. Temperature difference also plays a big role here in the enjoyment. The cookie, with its relatively low density and viscosity, tends to retain less of the coldness than the ice cream. Just as you are sinking your teeth into the cookie you suddenly hit gold and the sensation of chilled cream expands in your mouth – a refreshing surprise that repeats itself on each and every bite. Each 60 gram, 89 mL sandwich contains 170 calories and 14 grams of sugar. These are on the low end of the scale, making this a perfect dessert for those counting calories, and the individually wrapped packs make it easy to limit yourself to one sandwich per sitting. The perceived sweetness is actually quite intense, which is perplexing at first because of the low sugar content. However, this makes sense when you take into account the fact that the sandwiches are pretty small, and that sugar (in the form of organic dehydrated cane juice) is the second ingredient in both ice cream and cookies. The ingredients, mostly organic, are generally healthy, with the possible exception of caramel coloring present in the cookie. Caramel coloring, depending on how it is made, can be a carcinogen (see references) and cause problems with allergies. I don’t know the exact type of caramel coloring used here as it isn’t specified on the package, but I feel that using a more natural coloring agent (possibly a beet-based one) would be healthier. I’ve sent an email to Whole Foods requesting more information about this, will update this post when I receive a response. This product doesn’t have much going for it nutrition wise, with low levels of protein (3 g) and other common vitamins and minerals. A nice perk is that it is much more filling than many ice cream products, probably due to the flour used in the cookie.Also, organic cocoa is listed as the final ingredient for the cookie, which means there isn’t very much caffeine to worry about. In fact, I just had one of these sandwiches to stave off my hunger before I go to bed. This product generally sells for around $4.99 from Whole Foods Market. With six sandwiches per pack, thats less than one dollar per each, quite inexpensive for an organic dessert. Tasty organic snack, great for times you want to eat light.